In the first groundbreaking season of Star Wars Rebels, young hero Ezra Bridger joins the clever but motley crew of the starship Ghost in their resistance against the Empire. As the series begins, Imperial forces have occupied a remote planet, ruling with an iron fist and ruining the lives of its people. Ezra and his new rebel friends - Hera, Kanan, Sabine, Zeb and Chopper - embark on daring adventures in their fight against oppression across the galaxy, receiving help from familiar heroes such as Lando Calrissian, Ahsoka Tano, and Jedi Master Yoda. Pursued relentlessly by the Imperials and a Jedi hunter called the Inquisitor, this tenacious ragtag band of rebels will find itself in the crosshairs of none other than Darth Vader when Season One closes in a shocking two-part finale. While I was an on-again, off-again fan of The Clone Wars, one of my biggest issues with that animated series happened to be one of my biggest issues with the prequel movies as well – the desire/need by the creators to become overly complex with their storytelling at the expense of just having fun. With 'Rebels' set in the years following 'Revenge of the Sith' but before 'A New Hope', it can forget all that Separatist/Republic/Clone Army mumbo jumbo and get back to what made the Original Trilogy so much fun: the good versus evil fight against the Galactic Empire. 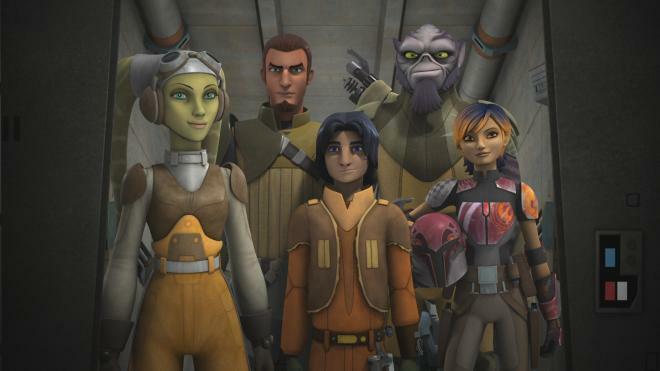 In the first episode of 'Rebels', viewers are introduced to Ezra Bridger (Taylor Gray), a young orphan who meets up with the crew of the spaceship Ghost when hijacking part of a shipment that the Ghost's crew is attempting to 'liberate' (i.e., steal) from the Empire. The Ghost's crew is headed up by Kanan Jarrus (Freddie Prinze, Jr.) who carries a lightsaber and just may be a Jedi Knight. 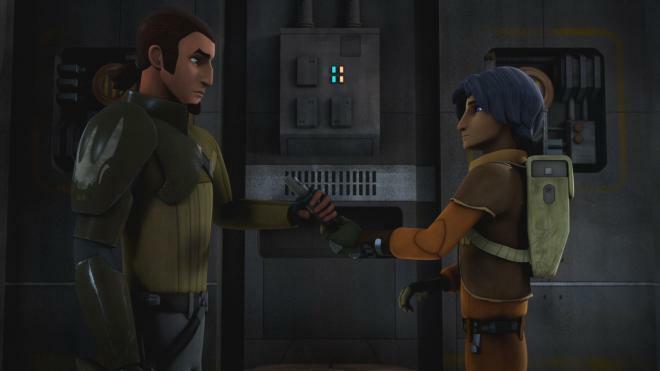 The pilot of the Ghost is the Twi'lek female Hera Syndulla (Vanessa Marshall), who is in a relationship with Kanan – well, at least as much of a relationship as can be presented on a kids-oriented animated series. Also part of the crew both for muscle and comic relief is Zeb (Steve Blum), who's kind of the Chewbacca of the crew…not only because he's almost seven feet tall, but because his character design matches the look Ralph McQuarrie had originally come up with for everyone's favorite Wookie. Rounding out the crew is the young Mandalorian female Sabine (Tiya Sircar) and the ship's astromech droid, Chopper. While the 15 (including a two-part opener) episodes on this release are more or less 'stand-alone' in content, there are plenty of ongoing elements as well, most of which focus on young Ezra's desire to learn more about the Force and find out about what really happened to his parents. While Darth Vader pops up at both the beginning and ending of this first season, the primary baddie here is The Inquisitor (Jason Isaacs), who wields a rather cool-looking lightsaber of his own and will face off against both Kanan and Ezra in the Season One finale. There are a lot of things to like about this first season, but one of the things I think that doesn't work very well is the creators' desire to bring in popular characters from the Original Trilogy. Not only do C-3PO and R2-D2 have a pointless cameo early on, but the worst episode of Season One features none other than the 'Baron of Smooth', Lando Calrissian (Billy Dee Williams), who finds himself in the middle of one of the lamest-written entries. A much better cameo connected to 'The Clone Wars' occurs at the end of the season, but I wouldn't dream of spoiling that in this review, only to say that this character's appearance adds rather than detracts from the ongoing story. Although it's been forgotten among many since its debut on Disney XD, the look and design of the animation in 'Rebels' is based on the late Ralph McQuarrie's original concept art for 'A New Hope'. While offering a more 'basic' design than the often lavishly animated 'The Clone Wars', mark me among the few who likes the look of 'Rebels' more than the series that proceeded it. What 'Rebels' lacks in detail it more than makes up for in style, providing a feel that is very reminiscent of the Original Trilogy films and a more colorful universe overall. I like 'Rebels' quite a bit, and think most 'Star Wars' fans should enjoy it as well. It's managed to introduce some very likable new characters into the official 'Star Wars' canon, while still tying things into 'The Clone Wars' series that proceeded it and the Original Trilogy films that follow it. 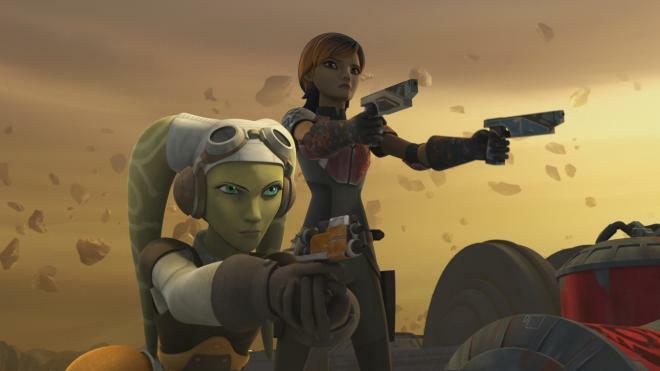 Also, given what we know at this point about Season Two (the first episode of which aired this past summer), 'Rebels' seems determined to continue to connect itself to previously known characters, both past and present. I think largely due to the way Disney has promoted this series as a kids' show, a lot of older fans have been ignoring 'Rebels' and that's a shame because it really is worthy of the 'Star Wars' name. Do yourself a favor and take a look at this Blu-ray release and see if you don't agree with me. The Force is strong with this one. Season One of 'Star Wars: Rebels' launches an assault on Blu-ray in a standard-size eco-LITE Vortex keepcase that looks like the same kind Sony uses (the type where you have to open a flap on the side before you open the case), even though this is a Disney release. The case houses the two 50GB Blu-rays, along with a pair of inserts – one containing a code for the Disney Movie Rewards program and one containing an advertisement for Disney's Movie Club. Disc 1 of this set features artwork of Ezra, while Disc 2 has artwork of Sabine. A slightly embossed slipcover with artwork matching that of the keepcase's slick slides overtop. There are no front-loaded trailers on either Blu-ray, whose main menu is designed to look like a computer panel onboard the Ghost spaceship, with footage from various episodes playing on the screen. Menu selections run across the bottom of the screen. The Blu-rays in this release are region-free. Although The Clone Wars series was animated and released on Blu-ray with a 2.35:1 aspect ratio, 'Rebels' sticks with the more open 1.78:1 ratio, and looks pretty great on Blu-ray. A lot of die-hard Star Wars fans dislike the 'Rebels' animation style when compared to 'The Clone Wars', but I'm one of those who actually prefer this look, which – despite clearly being more 'cartoonish' – also has a sense of depth and three-dimensional 'realism' to it that 'The Clone Wars' was never quite able to pull off. Those who picked up the various season releases of 'The Clone Wars' on Blu-ray will no doubt recall the banding issues that the majority of those releases had. That's not a problem here, as I could detect no noticable banding and only the slightest hint of aliasing here and there. Black levels are inky and deep, and there's zero issues with marcoblocking as well. In short, this is a really nice looking transfer of the first season. As was the issue when Disney released The Clone Wars: The Lost Missions on Blu-ray a little less than a year ago, the Mouse House – for whatever reason – seems to not understand the need to provide lossless audio for these animated episodes, and that's a real shame because the loss of dynamics can definitely be heard when listening to the sound on these entries. 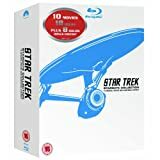 Which is not to say the English 5.1 Dolby Digital is horrible – it's not – it's just short of providing the 'oomph' that could have come from lossless audio and really made this a spectacular set to own. The dialogue is still crisp and clean, and there's still some nice directionality going on in each episode, with even some nice LFE use throughout – but I couldn't help but wondering how much better it all would have been had the English tracks been DTS-HD Master Audio instead of 5.1 Dolby. In addition to the lossy 5.1 English track, lossy 5.1 Dolby Digital tracks are also available in Spanish, French, and German. Subtitles come in English, English SDH, Spanish, and French. Rebels Recon (HD, 36 min.) – These are short webisodes that were created for each episode, during which Lucasfilm's Social Media Correspondent Andi Gutierrez recaps each entry and spends some time briefly interviewing a member of the 'Rebels' cast or crew. These segments can be watched individually or using a 'Play All' option. This first disc contains webisodes for the episodes 'Spark of Rebellion' (5 min. ); 'Droids in Distress' (4 ½ min. ); 'Fighter Flight' (5 min. ); 'Rise of the Old Masters' (4 ½ min. ); 'Breaking Ranks' (6 min. ); 'Out of Darkness' (5 ½ min. ); and 'Empire Day' (6 min.). Sneak Peaks (HD, 3 ½ min.) – A pair of trailers: one for 'Star Wars: The Force Awakens' (this is the second trailer, with Harrison Ford at the end) (2 min. ), and one for the upcoming Blu-ray release of Disney's Aladdin (1 ½ min.). Rebels Recon (HD, 45 min.) – More webisodes for the episodes contained on the second Blu-ray in this release. Once again, these segments can be watched individually or using a 'Play All' option. This second disc contains webisodes for the episodes 'Gathering Forces' (5 ½ min. ); 'Path of the Jedi' (6 min. ); 'Idiot's Array' (6 ½ min. ); 'Vision of Hope' (6 min. ); 'Call to Action' (6 min. ); 'Rebel Resolve' (6 min. ); and 'Fire Across the Galaxy' (9 ½ min.). 'Star Wars Rebels': The Ultimate Guide (HD, 22 min.) – This is an episode-length recap of Season One, narrated by the Kanan character (voice of Freddie Prinze, Jr.). 'Rebels' Season 2: A Look Ahead (HD, 7 min.) – Series Creator/Executive Producer and sometimes-Director Dave Filoni discusses what fans can look forward to in Season Two of the series. Also included here is the trailer for Season 2 that first previewed at Star Wars Celebration. 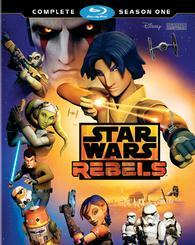 Count me as one of those who actually enjoy 'Rebels' more than I did The Clone Wars. Although clearly aimed at a younger audience than the prior animated series, 'Rebels' manages to deliver something 'The Clone Wars' more often than not failed to: that sense of fun and adventure that the Original Trilogy films gave fans. I can't imagine any serious 'Star Wars' aficionado who wouldn't want this set in their collection. Recommended.